Be the first to share your favorite memory, photo or story of Charles . This memorial page is dedicated for family, friends and future generations to celebrate the life of their loved one. 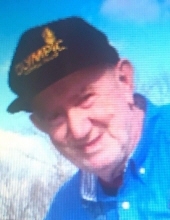 Charles “Mouse” D. Cox, age 76, of Herod, IL passed away November 29, 2018 at Hardin County General Hospital in Rosiclare, IL. Charles was born December 3, 1941 to William “Red” Allen and Elva Mae (Burton) Cox in Herod, IL. He helped his father on the farm, and worked at the Robinson saw mill. He enjoyed to garden. Charles is survived by his brother, Nolen Cox; sister, Thelma McDonald; several nieces and nephews. Funeral service is noon on Sunday, December 2, 2018 at Aly Funeral Home in Eddyville, IL. The service will be conducted by Bro. Harold Miller. Visitation will be from 11:00 a.m. until time of service. Interment will follow at Lavender Cemetery in Herod, IL. To send flowers or a remembrance gift to the family of Charles D. "Mouse" Cox, please visit our Tribute Store. "Email Address" would like to share the life celebration of Charles D. "Mouse" Cox. Click on the "link" to go to share a favorite memory or leave a condolence message for the family.